RaduLaur66 wrote: The shoulder boards are good. The combination of 2 colors in order to define arm of service is also good. My main objection is with regard to the full color shoulder board. It's my fault here that I've didn't get from the beginning the whole idea. 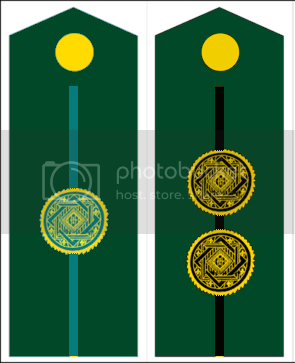 I should make the shoulder boards again, now there is an example of your suggestions. I'm afraid to not have fully understood what you mean. If you have a sketch or a similar real world example I'd be very grateful. Yes, the praefectus Legions is the most senior field officer. I'll try to use some DeviantArt material firstly designed by YamaLama1986. If I correctly understand, you devise a sort of British cap model, don't you? Given the collar patch referring to the branch of service, the Legion should be identified throught a sleeve insignia. This is the easiest part I believe. [quoe]I've seen 5 buttons jackets in the danish army...I don't know what to say. As I think that a Sam Brown belt would be a great idea , 4 button would look better. A red trimming for the shoulder boards (as is it for the General Field Marshal) rather than black would better serve our purpose, I believe. I see this uniform similar to russian or imperial german rather british inspired. General field marshal. To make it more simple, just the three eagles and two crossed battons would be enough.